We posted the reports from the two winning teams, (Quick Step & Canyon-SRAM) in the Team Time Trial with the results. The men’s TTT was contested over 62.8 kilometres with the demanding Axams hill positioned 40 kilometres into the race. Team Sunweb rebounded from a tough start, where they clocked in 23 seconds down on the fastest time, to set the new fastest time at the second checkpoint which came after the climb. Quickstep Floors winning time remained unshaken and Team Sunweb fought hard for a place on the podium. They crossed the line 18 seconds down on the title winner, to secure a silver medal. The race took place over a 54.5 kilometre route from Otztal to Innsbruck, the first event of this year’s world championships. A strong start saw the team’s squad power through to the first time check to take the fifth best time. 35 seconds down on the fastest at that split, the team fought for every second until the line. The team crossed the line with a final time of 1 hour 2 minutes and 15.27 seconds, enough to secure them the bronze medal. Ellen van Dijk said: “We are disappointed with third but we executed our plan just like we did last year. We didn’t start too hard and tried to make up time in the end, but this was a different course. We had a really good second part but couldn’t make up the time we lost in the first half – it’s really hard to know if you’re going fast enough and it feels fast because you’re going 55km/h, but the other teams were obviously going faster. We didn’t make any big mistakes, everything felt like it went really smoothly but we should have kept the pace higher. 23 September, 2018, Innsbruck (AUT): BMC Racing Team stood on the podium for the fifth consecutive time at the UCI World Championship Team Time Trial, securing the bronze medal after tackling the demanding 62.8km course in Innsbruck to cross the line 20 seconds behind winners Quick-Step Floors. After securing the silver medal in Bergen, Norway in 2017, BMC Racing Team was the second-to-last team to roll down the ramp and quickly settled into a good rhythm on the first, flat part of course. At the first intermediate checkpoint, after 22.8 kilometres of racing, the six-rider team of Patrick Bevin, Damiano Caruso, Rohan Dennis, Stefan Küng, Greg Van Avermaet, and Tejay van Garderen passed with the second-fastest time, 7'97" behind Mitchelton-SCOTT. The course featured a steep 4.6 kilometer climb, with an average gradient of 5.7 percent, requiring the team to pace the effort to reach the top with five riders, and from there it was a fast decent and run into the finish. At the second checkpoint at the top of the climb, the team was third-fastest behind Team Sunweb and Quick-Step Floors and with the three teams within four seconds of each other, it was clear the podium would be decided between them. 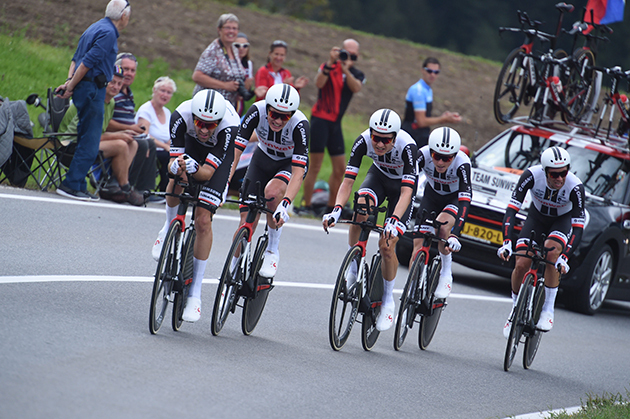 Ultimately, Quick-Step Floors managed to gain significant time in the final 20 kilometers and stopped the clock in 1:07:56, 18 seconds faster than Team Sunweb, who claimed the silver, and 20 seconds faster than BMC Racing Team. 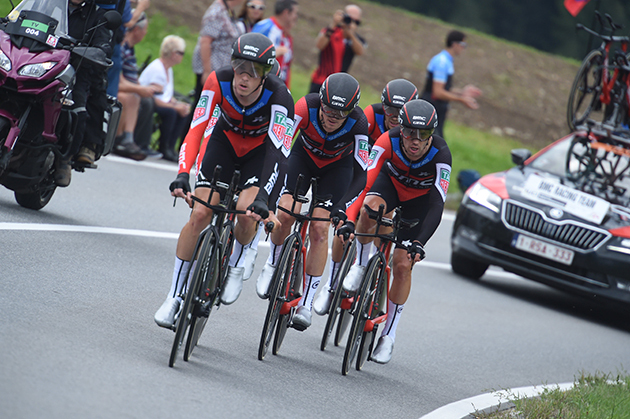 The race was not only the last trade Team Time Trial at the World Championships, but the last team time trial with the BMC Racing Team skinsuit on display, an end of an era for the team that has claimed 18 Team Time Trial victories over the years. "I think it went to plan and I suppose it was like every World Championships that we haven't won. We executed our plan perfectly but there was just a stronger team. Quick-Step Floors was just stronger from the top of the climb to the finish and that's where we lost time. We still don't know how but clearly they went faster than us. We did everything we could and I think we did really well. We did a good recon, we paced it right, we did the climb well and somewhere from there to the finish we lost time. Of course, everyone is disappointed but if we look back, we have either won or at least been on the podium at almost, if not all, the Team Time Trial World Championships that have happened. It's not the way we wanted to go out but it was still a respectable effort." "I think we could have maybe gotten closer to Quick-Step Floors at the finish but you never know. We thought that with Stefan being the bigger guy, it was important to use him over the flatter section before the climb. It would have been the perfect situation if we had got to the top of the climb with six guys who were all flying but, in reality, it was never going to happen and we thought that the best option was to use Stefan's strength for our benefit and get everything out of him that we possibly could and keep the rest of us a little fresher for the climb and the final." "Quick-Step Floors are always good. They don't have Tony Martin anymore but one rider doesn't win a Team Time Trial so, those guys have always been pretty solid as it is. They are always on our radar and we did think that they were top four definitely but in the end, we were thinking that Team Sky and Team Sunweb were the favorites to beat us." "The flat part before the climb went really quickly actually. I think on that 40-kilometer stretch we were going around 60 kilometers per hour so it wasn't really too bad. Then, the climb was ten minutes maximum and then there was some downhill which meant you got a little bit of recovery before the final flat part which also went pretty quickly. The distance itself wasn't really an issue and the time ended up being quicker than we thought it would. It was a 50 to 54 kilometers per hour average. It was a good course and we just got beaten by a better team." "It was a super fast course. I think it was a really special Team Time Trial with a steep climb pretty far into it. I think everyone on our team did their best to do as good a result as possible. We didn't lose by just one or two seconds but by almost 20 so we have to say bravo to Quick-Step Floors. They were stronger than us but we tried to defend a title we have previously held as best as possible and we are happy to at least finish on the podium." The team's bid to improve on 2017's bronze medal got off to a bad start as Ian Stannard suffered a crash in the opening kilometre on the first corner. The team waited for the former British national champion who was then able to continue, and the Team Sky sextet rallied to go through the first check point in provisional fourth. Mitchelton-Scott led the way at the early intermediate check point at 22km, with Team Sky 16 seconds behind and while Stannard was unable to assist by the second time check, the remaining five riders maintained fourth going into the final third of the 62.8km test. Team Sunweb and Quick-Step Floors were vying for the lead going into the final sector and Team Sky came in provisional second - 44 seconds behind Quick-Step - until BMC Racing and Sunweb bettered their time to fill the remaining spots on the podium. Sport Director Brett Lancaster rued Stannard's misfortune, but was impressed by how the British rider and team responded to the situation. He told TeamSky.com: "We were on the first kilometre and it was an easy right hander, and his wheel just slid out, we don't know what or why it happened, but it took quite a while to remount and the team waited for him. "That alone was a good 25 seconds and afterwards he sat on for a little bit to get his rhythm back whereas normally he'd be doing plenty of work, but his glute was really hurting so he couldn't put the usual power down." He continued: "The boys had to go pretty deep, and they knew that so they were going really fast on the flat once they got going again [after the crash]. Ian contributed all he could, but he was in a fair bit of pain and he did a good ride. "Without that we could have been well within the medals, but that's cycling. They gave everything, but finished with a fourth - that's a really fantastic ride considering what happened. I'd say to move on and give it everything next year, but this is the last one and unfortunately we didn't get to tick that box as a team." 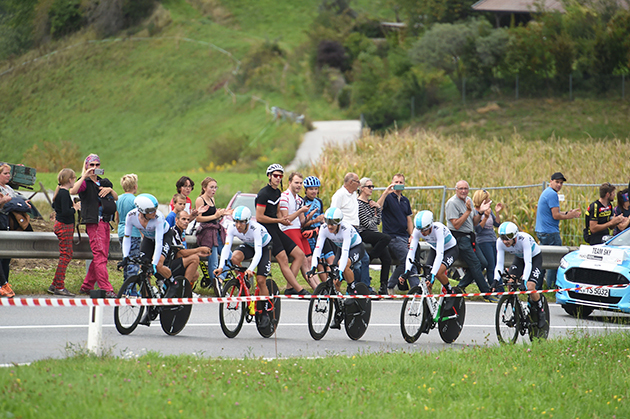 After specific preparations the last weeks, BORA – hansgrohe was focused on top result in today opening Team Time Trial at the World Championships in Innsbruck. But the team finished well behind their own expectations after a demanding 63.5-kilometer-long race. Still in contention on the first flat part, BORA – hansgrohe was not able to stick to plan and increase their speed on the decisive second part. While Quickstep-Floors took an impressive win, the German Team finished 8th today, more than two minutes down. Today (Sunday) the first medals will be handed out at the World Championships in Innsbruck, Austria. Lotto Soudal isn’t taking part in the team time trials, neither for men nor women. Next week, when the riders race in national teams Lotto Soudal will be represented. Below you find an overview of which riders are selected for which races. From Monday till Wednesday the individual time trials are scheduled. European time trial champion Victor Campenaerts comes into action on Wednesday. 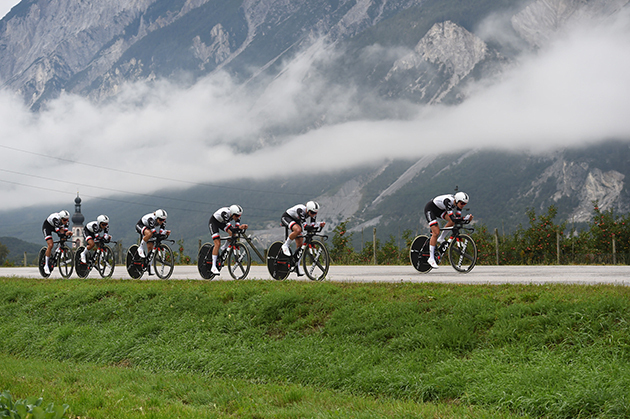 The men elite need to cover 52.5 kilometres, between Rattenberg and Innsbruck. After thirty kilometres the riders get to Gnadenwald. This is a climb of 4.9 kilometres with an average gradient of 7.1% and peaks up to 14%. Two days earlier Brent Van Moer will be taking part in the time trial for men U23. That’s a time trial of 27.8 kilometres with the finish in Innsbruck and start in Hall-Wattens. The U23 riders don’t need to climb the Gnadenwald. On Friday Brent Van Moer will be standing at the start of the U23 road race. Neo-pro Bjorg Lambrecht is also part of the Belgian line-up and is considered to be one of the contenders for the rainbow jersey. James Shaw is selected for Great-Britain. The U23 road race is 179.9 kilometres long. The riders start in Kufstein. Then it takes over eighty kilometres until they enter the local circuit in Innsbruck. This run-up, including the Gnadwenwald climb, is the same for all road races. The U23 riders need to cover the local lap of 23.8 kilometres in Innsbruck four times. There’s a climb of 7.9 kilometres on that course with an average gradient of 5.7% and peaks up to 10%. On Saturday the women will battle for the world title. There are three Lotto Soudal Ladies in the Belgian team: Valerie Demey, Julie Van De Velde and Kelly Van den Steen. Anabelle Dréville is riding for the French team. The women will cover three local laps. Their race is 156.2 kilometres long.